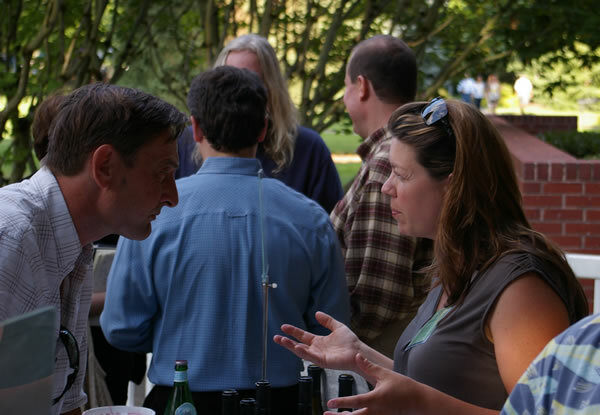 A seminar on 'Sustainability without sacrifice' at the IPNC, McMinnville, Oregon, July 2008, with Dominique Lafon, chaired by Jasper Morris. 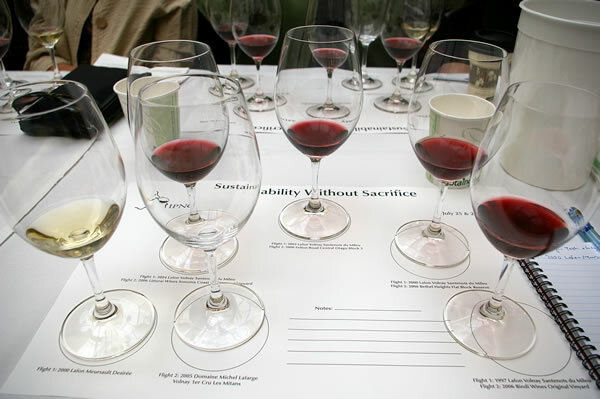 As part of the 2008 International Pinot Noir Celebration, celebrated Burgundy winemaker Dominique Lafon was the keynote speaker at a seminar on 'Sustainability without sacrifice'. He told the story about under his stewardship this great domaine shifted from conventional viticulture towards organics and then biodynamics. We also got to taste some of his wines. 14 different wines are made from 14 hectares, one-third of which is Pinot Noir, mostly in Volnay. The majority of his vines are Chardonnay in Meursault, with a little bit of Montrachet. When Dominique's father arrived at the domaine in 1956 it was a hard time for Burgundy. he was an engineer who did share cropping. The way this worked is that people worked in the vineyards and were allowed to keep half of the crop for themselves in exchange for their labour, with the domaine receiving the other half. It wasn't until the early 1980s that the contract was stopped and the Lafon family took back control of all their vineyards. Dominique arrived in 1987, after studying oenology, including spells in Oregon and California. Back in the 1980s farming practices varied. There were nine different people taking care of the vineyards (including Pierre Morey), and all had different methods of cultivation. Weedkillers and chemical fertilizers were being used. Dominique reveals how at this time a group of growers, all of his generation, felt that there should be a change. Together they moved in the direction of cleaner agriculture. 'I started with the chemicals when I took over', he reveals. 'there were all these merchants selling us products. they worked, but then they tell you they have a stronger product'. He was concerned that he might be poisoning his family. 'The more you try to fight nature, the more resistance emerges, and you need to fight more and more. It has no end'. He also thinks that the vineyards look different. ‘When I started the experiment, visually it was impressive. The vineyard had miserable crops, but it grew better and we got more crops.’ Dominique reports that there is a transition period, and that the most difficult part is changing from chemical agriculture to organic agriculture. ‘The vineyards cultivated with fertilizers are like those Tour de France guys’, he jokes. ‘It is quite a hard transition. When you start ploughing the vineyards you cut out the superficial roots. You have to get the soils started again to feed the vines. BD500 [one of the preparations] helps a lot in getting deeper roots.’ He points out that it’s actually easier if you don’t go from conventional viticulture to organics and then to biodynamics, but go straight from conventional to biodynamics. Is there anything in the cellar that is done differently now that Dominique has changed to biodynamics? ‘Not that much’, he replies. With Pinot Noir he doesn’t need to extract as much. ‘Pushy extraction was in fashion in the 1990s, but Pinot Noir has to be elegant and I don’t want too much extraction’. Burgundy expert Jasper Morris MW, who has 25 years’ experience with Lafon wines, has seen a change in how the wines taste since the switch to biodynamics. He cites three main differences. ‘First, there is enhanced purity. Second, there is greater minerality. Third, precise vineyard definition is clearer and more focused.’ ‘Each wine becomes more typical of each vineyard’, agrees Dominique. ‘It is very satisfying’.